Computex 2018: Qualcomm announces Snapdragon 850 Mobile Compute Platform for Always-On, Always-Connected Windows 10 PCs. Today at Computex, Qualcomm Technologies announced Snapdragon 850 mobile compute platform. The Snapdragon 850 Mobile Compute Platform is engineered to support always on, always connected Windows 10 PCs with new architectures for enhanced multi-day battery-life and performance, connectivity, immersive entertainment, and artificial intelligence (AI). The Snapdragon 850 Mobile Compute Platform is designed to support many sought-after smartphone features in the PC and to stay connected to LTE or Wi-Fi so users can receive notifications and have their data virtually always synced on the go. The power-efficient architecture is engineered to support up to 30 percent system-wide increase in performance and up to 3X AI performance over the previous generation, as well as up to 1.2 gigabits per second LTE connectivity speeds and up to 25 hours of continuous usage or multi-day battery life under normal usage conditions. With 10nm leading node efficiency, the Snapdragon 850 Mobile Compute Platform allows for sleeker and more portable, fanless designs for mobile customers, compared to current 14nm solutions. In addition, new and improved features on the Snapdragon 850 Mobile Compute Platform can support on-device experiences for AI, and users can expect camera, voice and battery life enhancements. In addition, advanced graphics and high-quality audio is designed to allow users to maximize their entertainment while viewing or capturing, all while bringing a Windows 10 experience, complete with productivity utilizing Cortana, entertainment and security. Qualcomm also announced at its press conference a joint effort with Samsung Electronics Co., Ltd to integrate the Qualcomm Snapdragon 850 Mobile Compute Platform, featuring the cutting-edge Snapdragon X20 and Qualcomm AI Engine in a future device. With Snapdragon 850, you'll get support for Instant On, for on-the-go entertainment and productivity virtually anytime, anywhere - and without missing a beat. The Snapdragon 850 features an incredibly efficient battery, to keep you powered for days on a single charge. With up to 25 hours of continuous local video playback or multi-day battery life under normal usage conditions your PC will stay on for a truly mobile experience. Supporting a small, portable, and fan-less form factor, PCs built on the Snapdragon 850 platform are designed to support robust performance that never weighs you down. The 10nm SoC's power-efficient architectures - including the Qualcomm Adreno 630 GPU and Qualcomm Kyro 385 CPU - are engineered to enable fast processing speeds for entertainment and productivity. The Snapdragon 850 Mobile Compupte Platform is designed to support both Wi-Fi (2x2 802.11ac) and Gigabit LTE, so you benefit from consistent connectivity. And with an "always-on" screen, your device is engineered to stay connected even while in sleep or standby mode. That means your PC can continue to sync and refresh even while you're not using it, so you can pick up right where you left off and get the most up-to-date notifications. Thanks to the integrated Snapdragon X20 LTE modem, you can experience fiber-optic speeds with up to 1.2 Gbps LTE that support downloads at lightning speeds virtually wherever you are. And it's not just about peak speeds; the Snapdragon X20 supports lightning fast connectivity (up to 70 percent faster than non-gigabit solutions), designed to better connect you even when there's a weak signal or you're on the edge of the network. From streaming to gaming, Snapdragon 850 is designed to deliver an immersive experience that will allow you to make the most of your entertainment. Complete with support for 10-bit HDR video and Hi-Fi surround sound, you'll truly feel like part of another world while binge-watching Game of Thrones. 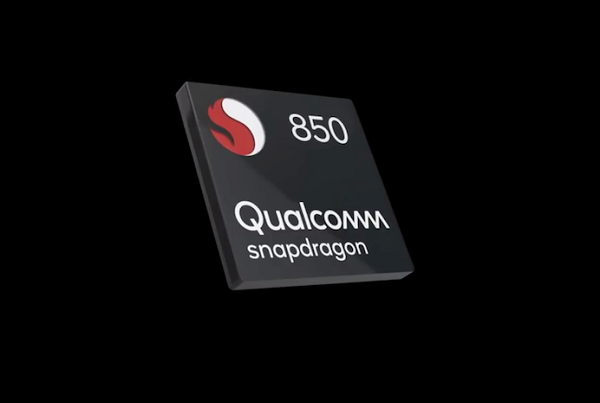 Thanks to its Qualcomm Spectra 280 ISP, the photo and video capture capabilities of the Snapdragon 850 are just as cutting-edge. With advanced low-light capabilities and 4K video capture at 60 FPS, you'll be able to create brilliant content, and video conference, in multiple forms. Rounding it all out is the powerful Qualcomm Artificial Intelligence Engine (AIE), which is optimized to support intelligent and compelling experiences across Snapdragon 850 powered devices. From camera and voice UI to battery life, the Qualcomm Hexagon 685 Vector DSP architecture - plus GPU and CPU optimizations - work together to run AI applications quickly and efficiently. What's more, this heterogeneous computing approach gives developers room to customize. With HW Acceleration with Windows ML SDK, developers have choices to support a myriad of neural networks and precisions, high quality apps, and to create their own compelling user experiences. Windows 10 devices powered by the Snapdragon Mobile Compute Platform are expected to be available in retail later this year.